After witnessing the building boom of the 90s and 2000s, where owners and architects followed the retro aesthetic like sheep, why wouldn’t we have another building boom in the next 15 years, when another trend catches on? 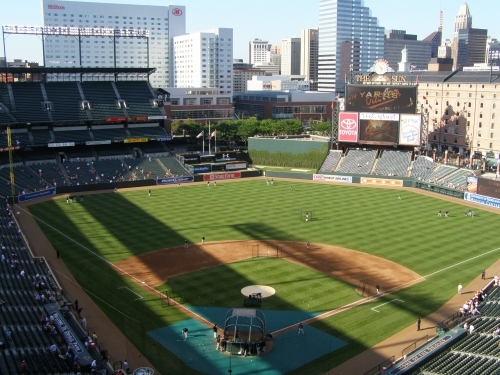 Most of these ballparks used Camden Yards as a template, breaking little new ground. When changing circumstances are fated upon these ballparks, whether it be economics or a changing aesthetic sensibility, why won’t your ballpark get replaced? It’s one thing to be an elite ballpark now, but what will make your new ballpark Wrigley Field or Fenway Park, not Shibe Park or Ebbets Field. There are so many factors that must be taken in account. One has to always wonder whether when Fenway or Wrigley were built, was there something special that indicated they’d be around 100 years later? Or is their existence sheer luck? What made them able to serve as the remnants of the Jewel Box Era? What made Wrigley and Fenway last? It’s a fascinating question that warrants more research, but the obvious answer is a combination of both. But I’d say that it lies more on the side of circumstance, especially in the case of Fenway Park. In the 1965, Boston pushed for a new domed stadium, just like the Tigers did in Detroit. The only reason their classic parks lasted is a failure in funding. As I will discuss in future articles, I’d argue for a sharp distinction between Wrigley Field and any other classic ballpark. Of course, like Fenway, it took until the 90s for it to enter “classic,” untouchable status. It was the only one of the bunch that wasn’t considered expendable during the multi-purpose stadium era of the 60s, to the point where the Cubs didn’t even consider replacement. It benefited from the most well designed grandstand of the classic parks, the best contextual integration, and the most aesthetically pleasing outfield scene. In hindsight, Wrigley Field is easily the best of the Jewel Box Parks. In hindsight, Wrigley Field ended up being the best of the Jewel Box parks, especially in terms of interior aesthetics. But it wasn’t anything special in its first 20 years of existence. But it wasn’t always that way. During the building boom at the turn of the 20th century, Shibe Park was considered the Camden Yards of the era. It was the first concrete and steel ballpark ever built and the nicest façade in baseball history, much more elaborate and nuanced than any of the streamlined retro mediocrity. Comiskey Park and Forbes Field were generally seen as the nicest Jewel Box Parks at the time, the former deemed the “Baseball Palace of the World.” Both were the most expensive of the era, until Yankee Stadium came along in 1923. While most of its hype was posthumous, Ebbets Field evolved into the most famous Jewel Box Park in the mind of most critics. Dodger Stadium and Kauffman Stadium (though muddled by renovations) largely entered into the “classic” realm because they were baseball-only facilities, but their architecture still deserves high praise, probably more so than the best ballparks today. So generally, it was a considerable amount of circumstance that allowed the current classic ballparks to exist. It especially matters how well a ballpark is maintained and the evolving state of the location during white flight (see Shibe especially). 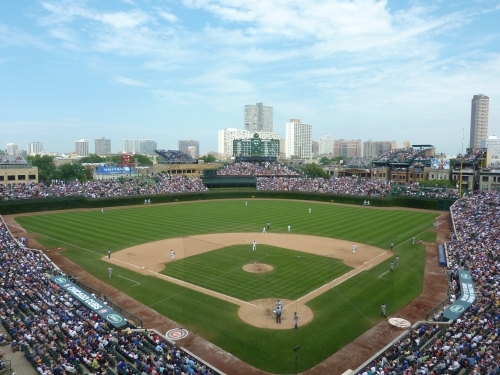 Wrigley Field was much cheaper than its peers, and Fenway wasn’t seen at the same level of Forbes, Comiskey or Shibe, highlighting that it matters more how a ballpark evolves than how it starts. Tiger Stadium was also unremarkable until later enhancements. In fact, while I know this is very controversial, I’d argue Tiger Stadium was always a bit overrrated, with a rather unremarkable exterior concrete facade and an ordinary interior design. But there are some peripheral factors that seemed to have helped Fenway and Wrigley’s continuing existence. The most significant is that the grandstand setup of both allowed for the significant integration of modern premium seating. Unlike Tiger Stadium and most of the era, Fenway and Wrigley had support columned upper decks further back that usual, allowing for the latter inclusion of luxury boxes and club seating. They had less obstructed view seats at the back of the lower bowl. 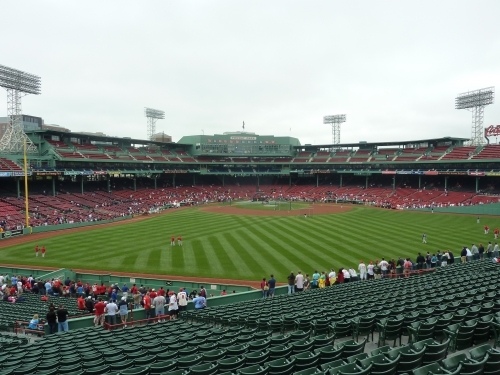 In the 1990s, compared to Tiger Stadium and Comiskey Park, Fenway Park and Wrigley Field had a grandstand setup that more easily allowed the integration of modern amenities. So again, it’s ultimately about economics. What about today’s ballparks? As I discuss in the retro architecture article, the retro trend is similar to other trends throughout history, so one would assume it would naturally go out of style. However, it also deserves some distinction. Baseball itself is deeply steeped in nostalgia, meaning these nostalgic facilities could last longer, despite being architecturally derivative and lacking the groundbreaking qualities one would expect. So retro could last longer than expected. Also, these ballparks were intended to last over 75 years, while the isolated cookie cutters were deemed replaceable early on. In 80 years, I see 4-6 ballparks lasting, more than doubling the two previous era’s lasting output. It should be noted that any future appreciation of these ballparks wouldn’t derive from phony contrived elements that may superficially identify them, but timeless architectural principles. There are multiple aspects to these ballparks that indicate they could be more timeless than their predecessors, especially the image in which they were built. But a large batch of them will eventually get replaced, perhaps sooner than one would think. It seems extremely problematic that architects look to the past for the fundamentals when designing ballparks, while modern progress in technology passes by. That being said, if you design something based on modern, progressive ideas, it will be obsolete once that technology progresses Retro, on the other hand, turns its back on field of modern architectural design in the interest is timelessness. Historically, buildings constructed in a neoclassical image withstand the test of time much more easily. In other words, retro is a safe approach, almost like a Band-Aid rather than a solution. Security is exactly what society, especially baseball, wanted at the time. You can connect it to the impending dooms of the ‘94 strike as well. So which of today’s ballparks will be the ones to survive? Is it a given that the consensus top three, PNC, Camden, and AT&T, will last longer than the others? Acknowledging how Fenway and Wrigley were not considered to be top three parks at the beginning of the era, it’s impossible to say. But I’m going to outline some factors that will influence which will last and which will get replaced. Camden, AT&T, and PNC are considered the top three ballparks today. Circa 1915, Shibe Park, Forbes Field, and Comiskey Park were the best of the era, but parks like Ebbets Field, Fenway Park, and Wrigley Field aged better throughout the century. This highlights the unpredictability of how ballparks evolve in perception and the factor of circumstance. It goes without saying, there are a number of societal factors that could come into play. The Midwest economy could completely dry up, causing teams in Detroit, Cleveland, ext, to move. Of course, interest in MLB could die out all together, but that’s another discussion. Since a seating innovation (suites and premium seating) initiated a building boom in the last 20 years, its only natural to assume another seating innovation will initiate a new “boom” of sorts. Somewhat similarly, general seating patterns changed during the transition to the cookie cutters. But not so fast. Throughout history, certain elements or ideas of a particular movement are rarely thrown away. When a new trend emerges, preceding elements of a style morph into each other to create something new. New styles often evolve from a synthesis rather than an explosion, resulting in a reconstitution instead of a radical renovation. 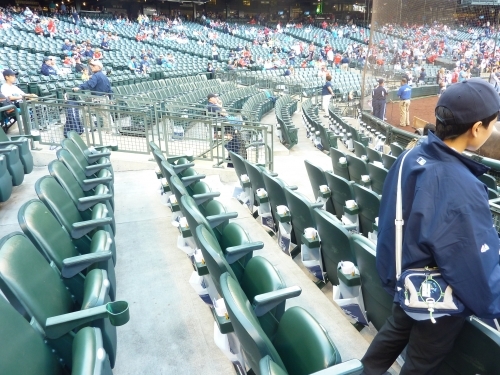 Premium seating at Safeco Field. New trends in premium seating drove the latest stadium-building boom. The invention of cantilevers made support columns obsolete, driving the 60s-70s multi-purpose building boom. Will a new, unforeseeable seating trend drive another one? While the ballparks of the future could change radically in terms of superficial design, premium-seating and other revenue producing concepts should gradually evolve, as we are seeing. We always love to assume new, radically innovative ideas come along, but they’re relatively rare. I don’t see anything truly radical enough to warrant new ballparks in the next 20 years. Due to what happened in the early 90s, its often assumed. But rest assured, if there is some sort of new radical premium seating concept that has high demand, or an unforeseen change in technology, we’ll see another building craze. Who knows? The separate suite level may be seen as a waste of space 50 years from now. This is the one category where it’s really impossible to speculate specifically. A lack of change in this category could be the reason for a lack replacement. By far, this will dictate the status of our new ballparks. Aesthetics and Architecture are strictly secondary, not to say it doesn’t carry weight. There’s a reason why New Comiskey Park lasted despite failing miserably in #2 and #3. Ballparks constructed with tried and true architectural principles and original designs, not derivative retro cookie cutter architecture, have a better chance of lasting. It’s inevitable: sometime during this millennium, maybe much sooner than you think, retro architecture is going to look painfully boring and uninspired. It’s already happening in some circles. Because of a distinct lack of originality, most ballparks are going to fall victim to a change in tastes. Even if one likes the retro aesthetic, there needs to be innovation, because the alternative is the same boring, repeated design ad infinitum. 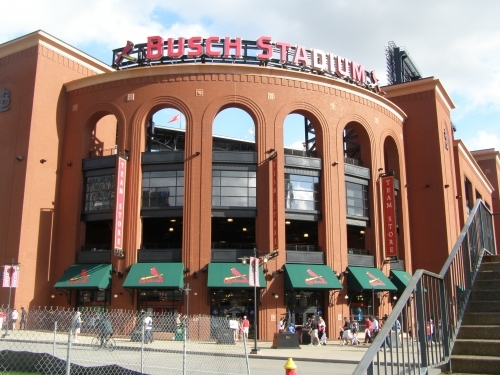 Busch Stadium. How quickly will retro become blasé to the general public? Architects that built exterior architecture that truly fit their cities and local communities are granted immunity. Parks like Jacobs Field and PNC Park went against the dominating aesthetic and designed beautiful facades that conform to the area. 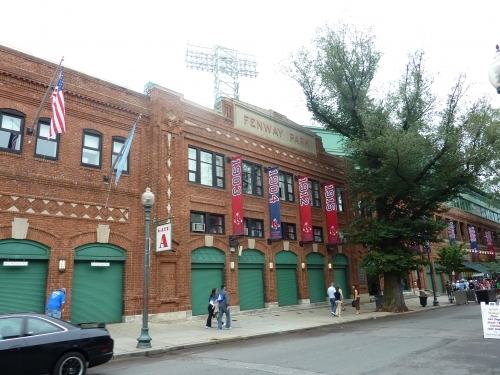 Other architecturally contextually based parks include Coors Field and Camden Yards. Generally speaking, parks that rely on extreme dimensions and loud gimmicky features won’t add to the timeless appeal. But how I simply describe a ballpark could be archaic in the future. I think how quickly architectural tastes can change is best illustrated in the opening of Skydome, which was considered a revolutionary venue when it opened in 1989. The novelty of having a stadium with a hotel, three restaurants, a giant video screen, a McDonalds, and a retractable dome wowed everybody. Only three years later after Camden opened, it was suddenly just a stadium. It will be harder to replace ballparks that are staples of the local community than ballparks in the middle of parking lots, obviously assuming the local community continues to be vibrant. Wrigley and Fenway lasted because their communities lasted. The status of the ballpark begins to matter just as much as the game itself, as the fans become part of the ballpark. This also implies aesthetic attraction beyond the outfield. A great ballpark has always been about connection to local context. It should be a vehicle of attachment between the fan, the players, and the local area. Camden Yards, Jacobs Field, Coors Field, Comerica Park, AT&T Park, PNC Park, Minute Maid Park, Petco Park, and Target Field succeed the most here. Of course, in the future, a suburban ballpark might be more ideal, but only if some widely unexpected, unforeseen event happens. Ok, so now I’ll list the ballparks that specifically have the best chance of looking great in 75 years. Of course, this is just for kicks, as it is impossible to truly predict. PNC Park (2001): The Best of the new; the best of them all. 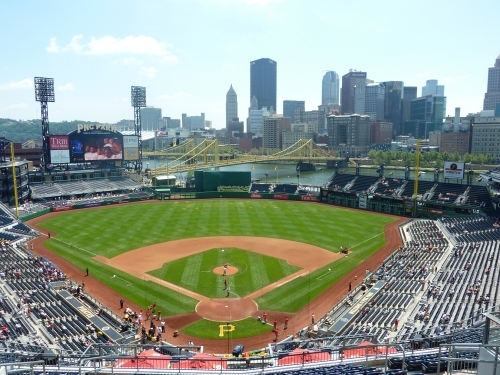 PNC Park has the best chance of being the Wrigley Field of the current era, assuming the Pirates stay in Pittsburgh and the river doesn’t overflow. PNC Park has the most aesthetic appeal of any ballpark ever built, both on the inside and the outside. The view is gorgeous and the contextual application of the view is even better. The exterior design is unique for the era, characterized by beige limestone and deep blues, mimicking the local landscape of the Allegany. Unlike other retro parks, it doesn’t attempt to distract fans with gimmicky features or contrived quirks, signaling that the game itself is interesting enough. Everything is brilliant. Best of all, the park is built on an intimate scale appropriate to the city. PNC is the first two deck ballpark since 1953. It avoids so many of the pitfalls many retro parks fell into. Camden Yards (1992): The one that started it all still has the best aesthetic interior design by some measures. Here’s one I have yet to officially review, but I went in 2008. Camden Yards is brilliant in its subtlety, such as the detailing on top of the scoreboard. Unlike some of the retro parks today, its great interior lines aren’t derived from some external kitschy treatment that try to overpower the game, supplemented by a sense of contexual authenticity. Like PNC Park, we have a timeless seating structure, unlike many of the others like Progressive Field and Yankee Stadium (listed below) that rely on an unsustainable premium seating model. Don’t underestimate that point. We have perfect balance; great architecture; great location; well-executed contextual integration; an appropriate scale; and the gorgeous warehouse to connect it all together. PNC Park and Camden Yards are clearly set to be superior in the future, due to innovation, high quality and novel exterior treatment, gorgeous interior aesthetics, great views, a great location, and a timeless egalitarian scale/seating structure. If only we could do something about that ugly new Hilton Hotel in the background. AT&T Park (2000): The lasting appeal of AT&T Park is its gorgeous bay views. The ballpark is situated right on the water, to the point where the dimensions conform to the sea. AT&T Park’s main flaw is its retro cookie cutter architecture, consisting of plain red brick, lacking true architectural merit. It also has multiple functional flaws, such the extremely narrow concourses. But it will be hard to ever replace this waterfront jewel, no matter what. Comerica Park (2000): By far, the most underrated of the retro parks. It’s not even close, as the initial verdict was way off, just for not being Tiger Stadium. This isn’t just a good ballpark, but a great one, today at least. After the video board gets replace in 2012, Comerica Park will be the least flawed ballpark in the majors, judging by 16 objective criteria. But aesthetically, Comerica is fantastic is well, despite not having the transcendental views of PNC of AT&T. In terms of contextual integration, Comerica is one of the best, if not the best, as even fans in the lower deck have the gorgeous Detroit skyline looming over them. Comerica’s lasting flaw will be its uninspired retro architecture, but its unique Tiger statues and gargoyles perhaps mitigate it. Also, the jury is out recent “mallparkification” of our new parks, which Comerica is especially a part of. Coors Field (1995): Denver’s ballpark figures to last because of its perfect location. No ballparks fits in with its surrounding like Coors Field fits in LoDo. In terms of architecture, Coors Field has the best façade of any of the new parks, which you can read in the review. Despite having a slightly less inspired interior design, most of which you can say about Camden, you can say about Coors. It also benefits from being more functionally sound. Progressive Field (1994): Another great forefather that correctly defined what a good “retro” ballpark is supposed to be: a structure that fits in with the environment. Like Camden Yards, Jacobs Field interior design is seamlessly executed, but it’s even more impressive because they don’t have that signature element yet somehow make it work just as well. We have a fantastic exterior design that screams Cleveland. We have a great location. Jacobs Field is pretty much Cleveland’s Camden Yards to a tee, making it underrated. I’ve written about all of this ad nausium. Unfortunately, it’s going to struggle because of its functional flaws. The seating geometry is permanently skewed and they’re going to have trouble selling their 100s of luxury suites for many years. New Yankee Stadium (2009): Before you jump to conclusions, I’m not suggesting Yankee Stadium has particularly good interior or exterior architecture. In fact, I’m suggesting just the opposite. The entire ballpark is an incredibly safe effort. But that’s the point. Yankee Stadium benefited from not having to design an original ballpark, but copy the Old Classic Yankee Stadium. For that reason, New Yankee Stadium is likely to last. This is of course assuming their egregious premium seating model isn’t rendered unacceptable in the future, but like I said earlier, that will affect everybody more or less, with the PNC and Camden being slightly more immune. Why Wouldn’t This Ballpark be replaced in the next 25-30 Years? Some criticized ballparks, such as Great American Ballpark, have the potential evolve with interior renovations. These ballparks I’m listing are fundamentally flawed in factors like location, architecture, and originality, likely to go by the waste side during the next ballpark boom. Citi Field (2009): The last Ebbets Field copycat. The question is, why? Why not design an original ballpark, reflecting the architecture of New York City? Worse yet, they built a much worse streamlined version of Ebbets. It’s not ugly, but just compare the nuances of both on the outside. The interior is an enclosed muddled monstrosity, characterized by contrived quirks and a bevy of ugly ads. The poor location doesn’t help. There’s nothing that makes this one stick out, despite getting reasonably good reviews under my ratings consensus section due to the amenities. Turner Field (1997): Where to start. See my review. I’d be shocked to see it get replaced in the next 5 years, but there is an outside chance here compared to the others: the lease expires in 2016, the lease terms are not at all favorable revenue wise from the Braves standpoint, it was essentially a free gift originally built for the Olympics, and the team has always been honest about their disdain for the location. If management pushes for it, this could be the first retro park to get replaced. It seems like a long shot, as the safe call is to just renew (or renegociate) the Turner Field lease. Probably just wishful thinking on my part, as there would be so many hoops to jump through anyway to get a new ballpark. Rangers Ballpark in Arlington (1994): There’s plenty to like, but it’s the first retro cookie cutter. Rangers Ballpark is the Disneyland of ballparks, a self contained, faux urban retro structure in the middle of a parking lot. Once tastes change, this ones gone. Citizens Bank Park (2004): This park has generally gotten great reviews due to superior amenities and functionality. But Citizens Bank Park suffers from a poor suburban location, coupled with a lack of originality and a derivative retro cloak. Once we see a new wave of ballparks, there’s no reason to keep this one around. Remember, no matter how great the amenities are in the present, that doesn’t translate to the future if there is no reason to keep the structure around. Chase Field (1998): Chase Field is an enclosed, often described “gym like” ballpark, which tried to be retro but probably shouldn’t have. Despite having a decent downtown location, the exterior design is a schizophrenic mess. Many consider the interior the least aesthetically appealing of the new parks; there is little local Arizona flare in this “mall-like” park. The functionality of the roof will be brought up as years progress, but its mechanisms are fairly simple, so it shouldn’t be an issue. This could be the first one to go. Miller Park (2001): In my opinion, Miller Park might be the most vulnerable of all the new parks. But at the same time, they may want to keep it around because it is unique. Its innovative fan shaped roof has already experienced functional problems, to the point where it could turn into an Olympic Stadium (Montréal) by the end of the decade. Once you take that away, it has no appeal. Even if that doesn’t happen, Miller Park still has a lot going against it. It’s the only one of the retractable roof ballparks to have a suburban location. The interior design is bland. On the flip side, the fan shaped roof could be used as an argument for structural originality, so they’d want to preserve this ballpark. Once Tampa and Oakland get their new ballpark situation in order, which will be sometime after 2015, you’ll here whispers from Toronto, realizing they have the only multi-purpose facility in baseball. By the end of the decade or so, you’ll see the Blue Jays demand a new ballpark, though they might not have the audacity because the city will never support it. In my opinion, Rogers Cable will eventually sell the team and they will move. Anyway, after that point, some of these ballparks will look very dated as well, and Miller Park could be the first to get whispers around 2025.